Presidential hopeful Bernie Sanders has been talking a lot about the minimum wage and the cost of education in this country. It’s been a subject of course of many democrats. 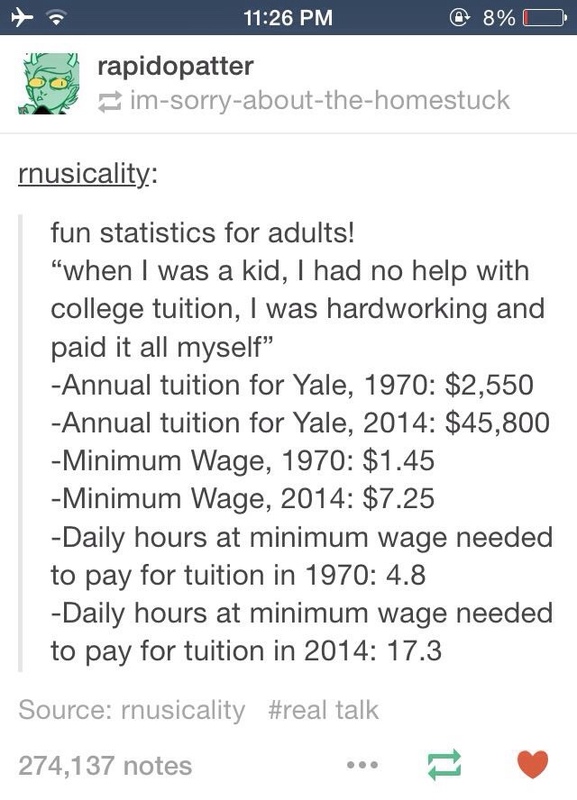 One of the memes that I think ties both together well is the one that shows how many hours in a day you would have to work to pay off yearly tuition at Yale at minimum wage in 19—compared to today. 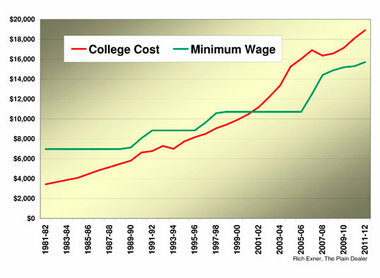 But I don’t want to talk so much about minimum wage, but rather the cost of education. Bernie Sanders would like to make it free at public institutions. There are many memes mocking this idea, mostly in regards to this being a wild campaign promise that has no chance of coming true. Or questioning where all the money is going to come from. Bernie has a plan for that but I’d like to take the politics out for a second and question why anybody would be opposed to the idea of free tuition at public universities. Can anybody argue that an educated public is not better than an uneducated one? Regardless of the type of government a public that is educated simply has less chance of becoming oppressed at least long-term than one that is uneducated. In fact we should be worried about a society in which education is become less and less valued, and less accessible to a good portion of the population. 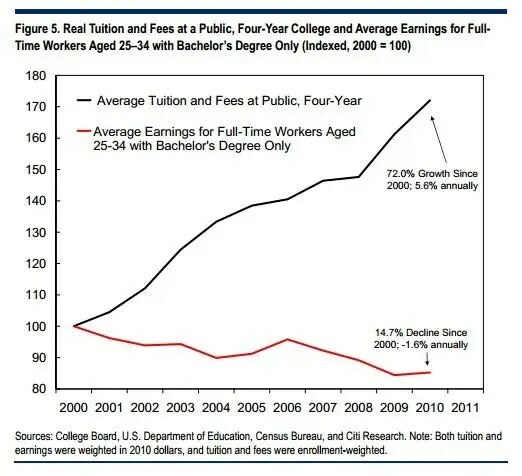 The constantly rising price of tuition and the decreasing middle class certainly implies a general decrease in access of education for many families. Sure student loans are an option, but that’s a heavy cost one has to pay going $40,000 or $50,000 in debt puts you behind the 8 ball for sure through most of your young life. My generation (which would be about the age of many the students now) or the previous one never had to start out life that way, so why should it be that way for this generation? A more educated one is also more civil and less divided. We argue in this country over issues that are non-issues to most other industrial nations. Issues that become politicized which have no need to belong to one party or the other because they are simply something we need to all agree on and do something about. As the public becomes less and less literate on important issues such as climate change, GMO’s, vaccines, environmental conservation divides in viewpoints exist when they should not. Even when viewpoints do differ and educated public will force the debate to be relevant, and compromise is more easily found. A democracy is only successful when everybody participates. But how can people effectively participate when they don’t understand the issues? For many who participate their vote is based less on an understanding the issues over more surface based and emotional reasons. Look at any country in which all people have equal access to education and you will find a country with less crime, a large middle class, and a productive economy. So why would anybody oppose free university education without seriously looking at how it could be done. It’s not like we don’t have the money but yes it would cause us to put less priority one thing to put the priority on education. It’s simply unclear to me why equal access to education wouldn’t be a primary concern for any nation. Education makes business better, but that does not mean education should be a business. As soon as we turn education into a product we’ve ruined it. This is because like any product, when the quality is high, the cost is also high and few can afford it. People with less money who want that same product end up getting a cheaper version of the product that simply isn’t as good. 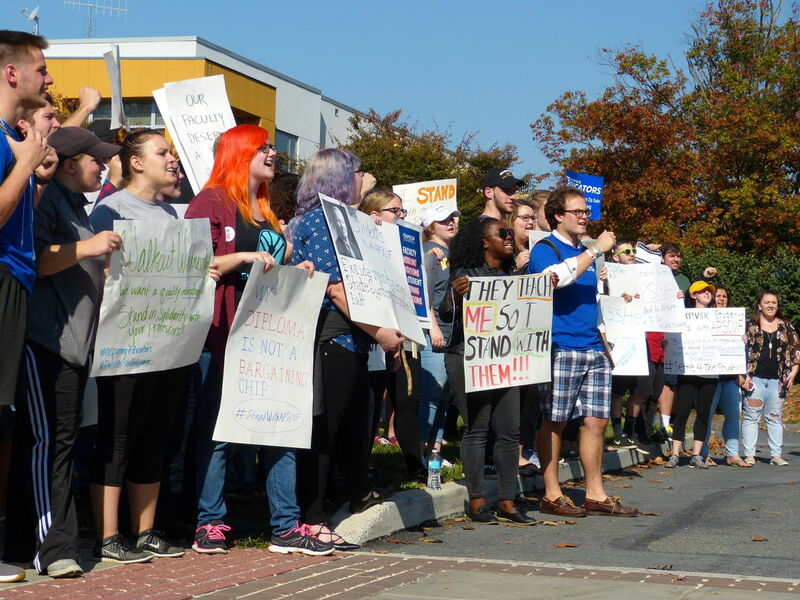 Most universities do want to keep their quality high, but it leaves them with a choice of raising tuition costs to do so, or lowering standards of enrollment to get more students. After they’ve let more students in who they know will struggle in university they end up inflating grades or lowering expectations so they can appear ethical and that they haven’t just let a bunch of students in only to make money. Anybody who is in academia sees this business model as a terrible way to run education and yet it seems to be the trend. There is no doubt in my mind it will come back to bite us. So let us not oppose the idea of free college education, let us work together to find a way that it can happen. Other nations are able to provide this to their citizens. Why can we not do the same? It really is to everybody’s benefit. There are many things I don’t understand about my college students. In my 13th year of teaching as a professor I think I can at least make some solid observations. Much of what I observed leaves me with more questions than answers. My undergraduate experience was perhaps not typical in any way. My parents paid my tuition, which was heavily subsidized by the Canadian government. It is still a decent $3.500 for the year, which was a decent sum of money was back in the early 90’s. I lived at home though, the university was about a 50 minute transit ride. I am sure the fact that my mom got me a part time job at the university signing student loans was important in realizing how fortunate I was to not have to go in debt to pay for tuition. My parents instilled in me that education was important and that doing well was also important. That being said, despite the work I put in, I still ended up with only a B+ average in my undergraduate. It was a lot of math and physics, and it was hard. I wasn’t the perfect student either. I cut a number of classes, but I was always aware when things were due and when were really important days to be there. I never missed a deadline or a test. If poor attendance led me to a less than perfect grade, there really was no one to blame but myself. Sometimes you did get a bad teacher that discouraged you from wanting to attend that class. But sometimes there are bad teachers. You can complain, but it’s probably not going to make them a whole lot better. Everyone was in the same boat and you did your best. I never drank alcohol as an undergraduate; neither did most of my friends actually. Which is perhaps a bit odd considering the legal drinking age in my province is 18. I still have lots of fond memories of those days, and think it was a rather fun period of my life. Please don’t get me wrong as I have met many mature students. I would easily say that half of the students that I see, even ones that might not be doing particularly well in my classes will graduate and hit the ground running. I hesitate to say too many numbers as my observations are only anecdotal, but I would say after teaching over 200 students a semester in 12 years that there are, conservatively, 20% who really don’t care and really would prefer to not be in college (or rather not be in college for the purposes of education). Given how competitive it is to get a job, given how expensive it is to get an education, and given how salaries haven’t kept pace with inflation, why spend $50,000 on an education, to get a mediocre to poor GPA (especially when you’re field of choice has a low amount of jobs available)? Isn’t there a better way to spend your time, money and resources? For some people it is loan money, for some it is their parent’s money. Interestingly I have never met a student who was paying for their own tuition who didn’t understand the importance of doing well and make the most of the money they were spending. So ask yourself the question “Why are you here?” And think about whether you might not be better off somewhere else. Somewhere that was better suited to wear you are in life. Somewhere better suited to what you want to do. Somewhere that will give you a chance to figure out what it is you really want so that when you do enter college you are ready to get the most out of that environment. College is an immense challenge in terms of your time and energy. You will expand your mind and your heart. You will meet great people from different walks of life. But, like it or not, university is about learning and education. You can party anywhere like a rock star any where. But think about the fact that your country needs you. Young people are the ones with the energy, the ability to learn at a faster rate and think outside of the box. Young people are the ones who are most needed in a democracy to be educated about issues. Issues that they will face in the many years ahead of them. There is a surprising amount of time to still have fun, but also start being a positive part of society and perhaps not getting wasted every night. I love my job because of all the great young people I’ve met over the years, I just want to see young people also think critically about their decision to go to university. One facet of human nature that fascinates me is the idea of destiny. Now when I say destiny here I don’t mean like some blockbuster movie in which I am destined to save the princess, fulfill the prophecy and become the most benevolent leader of mankind. I am talking about something more fundamental than that. What some people might refer to as “a calling”. And maybe not even in the sense of a career only, but rather one’s passions, one’s nature. It is not too surprising that I am reflecting on that, because as I watch my son, I wonder what he’s going to be like. What will his interests be? How will he want to live his life and how different will that be from me or his mother? The nurturing influence of parents cannot be overlooked, but we’ve all known people who were vastly different from their parents in some very fundamental ways. Two parents might be very messy and their child is neat. Two parents might be teachers, and their child wants to run his own business. Of course trying to determine why somebody ends up the way they do is a fool’s errand in a lot of ways, because nurture is not just a function of parents, but of teachers, friends, relatives, society, etc. It could be that one day a kid sees a fancy car that he just loves and says to himself, alright how do I get a job that allows me to drive around with that. Perhaps not the most noble of callings, but he we like shiny things that enhance our status and so these kinds of things certainly happen. astronomy, meteorology, and geology. I loved all 3 of those and at the time they had us thinking about careers, but I was already hooked on meteorology and I decided then that I was going to be a meteorologist. During my undergraduate I decided that being a forecaster wasn’t for me and wanted to teach it so I went to grad school and I loved it and don’t regret a second of it. At the end of my undergraduate I took a linguistics course and I loved it. At that time I questioned my career decision a little, but it was my last year of undergrad and it seemed too late to do anything else, and what did it matter, I still loved the weather. I do think that I would be just as happy if I had chosen linguistics as a career had I been introduced to it earlier in life. Now my interests lie in cognitive science and neuroscience. I could definitely see myself being a researcher, or even a clinical psychologist because I am deeply interested in understanding others and our nature, and feel I have some aptitude in understanding the motivations of others. Despite these ponderings on alternative careers, I still don’t have any regrets. I enjoy my job, and perhaps being a professor is the reason I have had time to pursue these other passions. But it has led me to some questions about this idea that I was somehow “destined” to be in the atmospheric sciences. Would I still have become what I became had I not lived in a climate that did not have thunderstorms? What if our curriculum in grade 6 did not include learning about clouds? What if the grade 8 science curriculum didn’t have meteorology which helped me appreciate the subject at a greater depth and attract me to it even more? What if I had a mother who was afraid of storms and that made me afraid of storms? Yet my choice to go into meteorology seems beyond these things. We had lots of subjects in school and with some good teachers. Why didn’t any of those subjects arouse a passion in me? My parents were not scientists, teachers, historians, writers, etc. and it seems that they didn’t influence me in any particular academic field so I could have chosen anything. In terms of time, we spent more time learning about many other subjects than meteorology. There are rocks everywhere and I had been to the Rockies, so why didn’t I go into geology? I loved watching nature shows so why didn’t I become a biologist? Why did I feel I had a “calling” when I meet so many students who aren’t even sure what they want to do? Is this a rare feeling? Or do other people feel it and just ignore it? I don’t know that I have an answer to any of these questions, but what I do know is that I was very fortunate. I’ve seen many students with a passion for meteorology but very weak quantitative skills, having weaknesses in math and physics that forced them to take a different career path even if their interest remains. I do not have that problem. I am fortunate by circumstances having parents who worked hard for me to give me a chance to pursue my passions. I wonder how many people feel this “calling” towards science, the arts, humanities, history, education, etc., but simply must take a job as soon as possible to support a family. Maybe they can’t afford to go to school and don’t want to take out student loans. Some people might argue that their “calling” is perhaps not that strong to drive them, but there are practical realities that must be adhered to and when basic needs must be met they simply must be taken care of first. Somewhere there are people who could have been brilliant athletes with enough training and leisure time, but instead had to work in a factory to support their family. How many geniuses have simply died of starvation? How many talented artists have died of curable diseases simply because they couldn’t afford a doctor or the vaccine that would have save their life, or a doctor or vaccine simply wasn’t available? In the end I don’t think I subscribe to this idea of destiny, because whatever natural passions we have, they must be cultivated, and even those passions may fade slightly as new ones take their place. In the end I can only be thankful for the natural gifts I seem to possess and the family, friends, and society that has allowed me to develop them.